Disclaimer: While most mushrooms are neither particularly tasty OR poisonous, extra care should be taken to positively ID any mushroom before eating. As with any form of identification, judgement should not be made on any single characteristic but a combination of characteristics and people new to mushrooms should consult with an experienced grower/forager. The only surefire way to ID is with a spore print. WHEN IN DOUBT, THROW IT OUT! 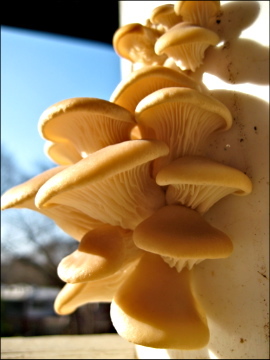 This page offers information on identification of the mushrooms we are promoting for cultivation, along with any possible lookalikes. At the bottom of the page you will fin links to resources for identification of wild mushrooms, something we are not focused on in our research work. This information is accurate to North America only. – LOCATION: What habitat is the mushroom growing in? Is it growing from the ground or a decaying tree? – FORM: Is it a cap-and-stem mushroom or shelf or? What is the color, shape, size texture? – SPORE PRINT: The final item of identification comes from taking a spore print. Galerina marginata; These mushrooms go grow from wild logs in the forest. 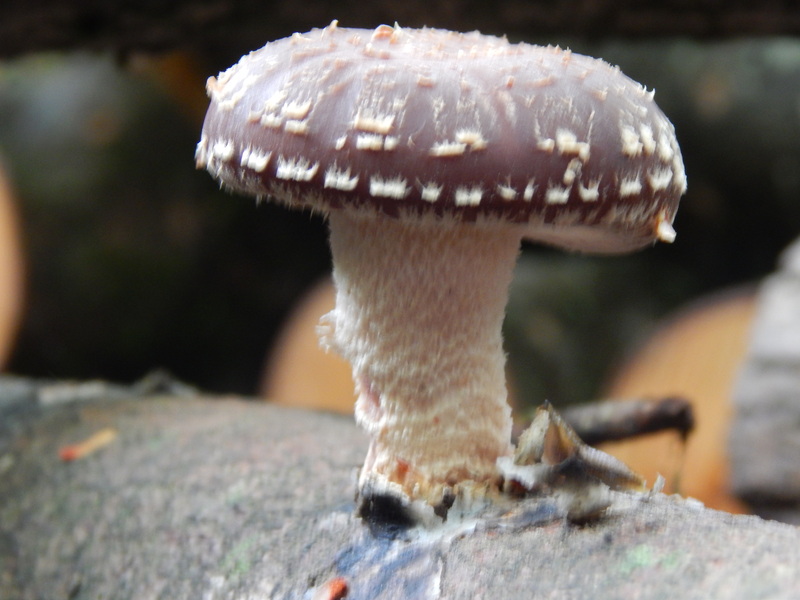 (again, you will only find shiitake on cultivated logs) The fruit bodies of this fungus have brown to yellow-brown cap, with gills are brownish and give a rusty spore print. This is a poisonous mushroom. To reliably distinguish a Galerina from a shiitake, make a spore print. Cut off the stem and place the cap, gills down, on white paper. Cover it with a bowl to keep it moist. Galerina always gives a brown spore print after some hours to overnight; a shiitake spore print is always white. Gill color is not a reliable substitute for a spore print because young Galerina gills can look pale –they’ll darken with age. Additionally, Galerinas usually have a ring (annulus) around the stem, however, it may degrade as the mushroom ages, and that is why a spore print is a more reliable indicator. The ring is the remnant of a membrane that covers the gills of young Galerinas —it runs between the edge of the cap and the stem. As a young mushroom opens, the membrane tears at the cap edge and becomes the ring. In the young Galerina at the back of this photo you can see the pale membrane that is breaking to become the ring. Shiitakes never have a ring, no matter what age. In addition, there are many species commonly referrred to as “little brown mushrooms” that grow from logs or on the ground. Basic ID and a spore print will easily confirm what you have is a shiitake. Stem: May not have one. If they do, often stubby and off-center. No ring around the stem, or bulge at the base. Growing habitat: Oyster will ONLY be found growing from hardwood logs, often beech and poplar and very occasional conifers. They are found in summer and fall. Often they have a slight anise/licorice scent. Omphalotus nidiformis: a poisonous look-alike found in Australia and Japan, but not found in North America. In addition, there are many species of poisonous mushrooms that are WHITE in color, but none have the combination of the characteristics above. 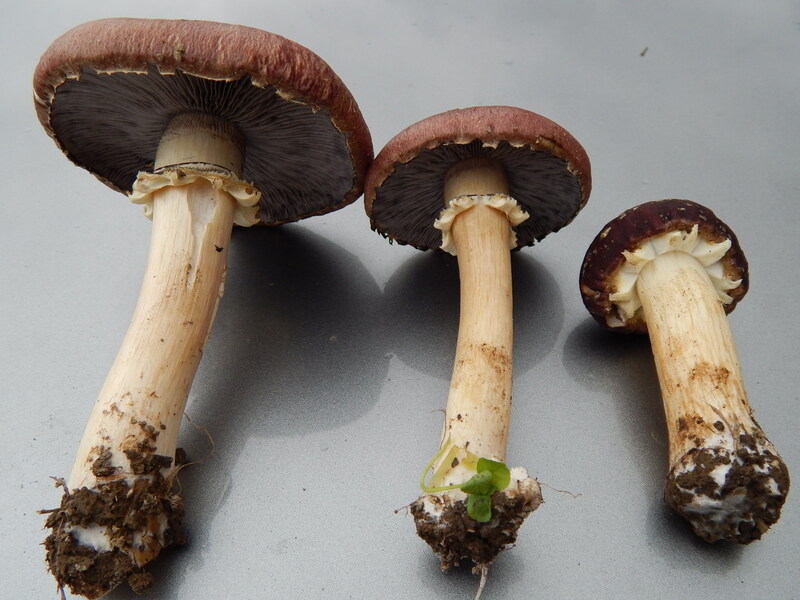 Growing habitat: Stropharia is found growing on wood-chip or duff layer debris in forests, pastures, and lawns. None specific, though mushrooms with a reddish cap and/or ring around the stem could be confused for stropharia. In over-mature stages it could be confused with Agrocybe praeox. Description: A single, unbranches clump of soft spines hanging from a tough, hidden “base” (stem) that is firmly attached to tree. Generally white with sometimes a brown or yellow discoloring as it ages. Growing habitat: Grows only on hardwoods (Oak, beech common), usually in Fall but sometimes in Spring as well. Possible lookalikes: None, generally. 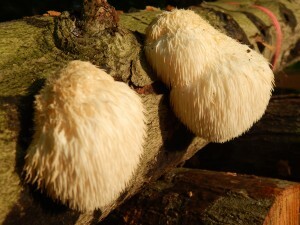 All species of Hericium are edible and delicious. Only possible to mistake for something else in a very small form. Make sure teeth are present! it is the only North American species that forms a single clump of dangling spines.